Saintly Paulo discovers he’s doomed to share the fate of a complete stranger, Enrico. Then he meets Enrico for himself and realises he’s evil incarnate. If he’s damned, is Paulo too? 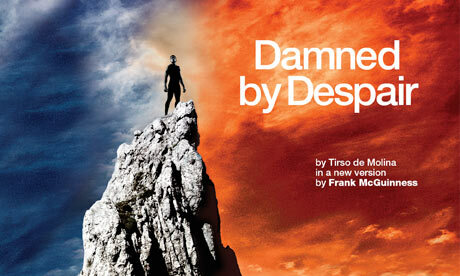 17th century Naples and gang culture collide spectacularly in Damned by Despair, a Spanish classic brought to life in vivid modern language by Frank McGuinness. NT Associate Director Bijan Sheibani brings this epic production to the Olivier stage following the success of his previous work at the National Theatre including The Kitchen and Our Class. Sebastian Armesto (A Woman Killed With Kindness) and 2012 Olivier award-winner Bertie Carvel play Paulo and Enrico. This entry was posted in ARTS, THEATRE, WHAT'S ON and tagged london, National Theatre, Spain, THEATRE, TIRSO DE MOLINA. Bookmark the permalink.